The QPercentBarSeries class presents a series of categorized data as a percentage of each category. This class draws data as a series of uniformly sized vertically stacked bars, with one bar per category. Each bar set added to the series contributes a single segment to each stacked bar. The segment size corresponds to the percentage of the segment value compared with the total value of all segments in the stack. Bars with zero value are not drawn. 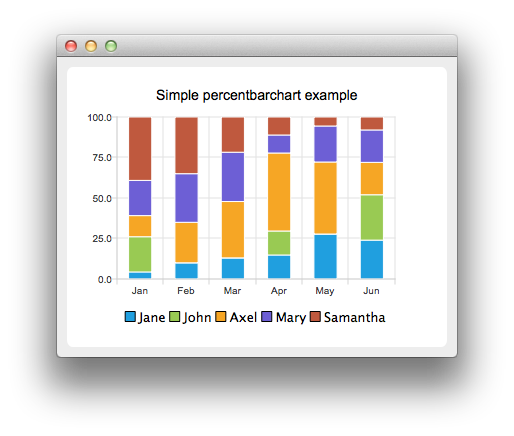 See the percent bar chart example to learn how to create a percent bar chart. See also QBarSet, QStackedBarSeries, and QAbstractBarSeries. Constructs an empty vertical percent bar series that is a QObject and a child of parent. Returns the vertical percent bar series.